In this lesson we will look at receiving a Credit Card payment from a customer. We will be focusing mainly on the Receipt Information section. If you need help with the other sections of the Receipt window then see this article for a more generic look at creating a new Receipt. 1. Set Up a new Receipt Type. See this article for help on setting up a new Receipt Type. 2. Set Up the Credit Card Gateway. See this article for help on setting up the Credit Card Gateway. AcctVantage supports processing of credit cards through Authorize.net. If you run cards using a different merchant account you can still manually record all of the details for a credit card sale, minus the Run Card function. Create a new Receipt according to the instructions here. Date: This is the date the Receipt occurred. Pre-auth Amount: If you want to pre-authorize (but not charge) a customer's card you will enter that Amount here. Card Number, Expires and Sec. Code are mandatory fields. After the card is charged Authorization No. will be populated. A default credit card can be stored on the Client's record and will auto-populate here if found. 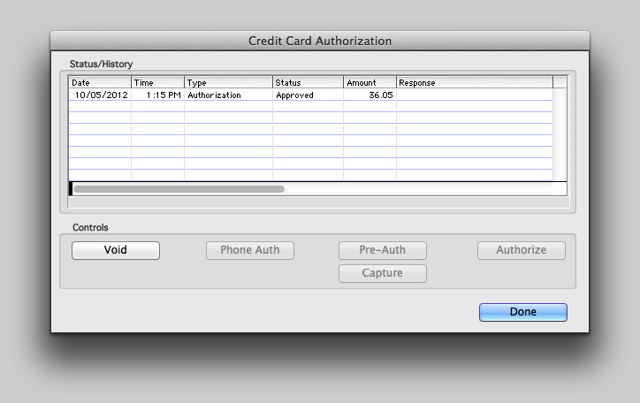 Note: If you are not using AcctVantage to process the credit card, you can manually enter an Authorization No. Credit Card Information: Name on Card is mandatory. The Address is optional unless you have enabled AV to pass this info to the CC Gateway for verification in System Setup. Run Card: This will start the Credit Card Authorization process. 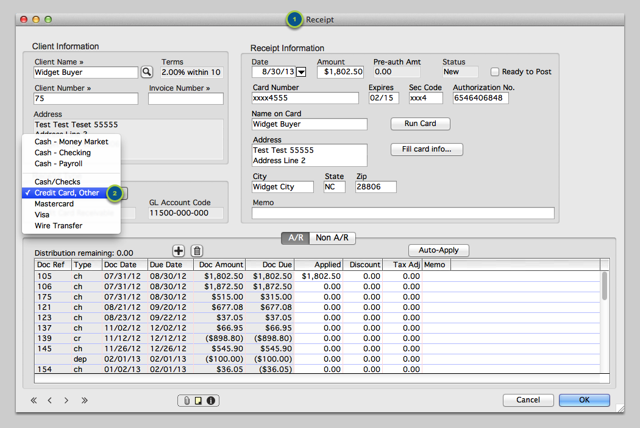 Fill card info: This function allows you to select a card, and load its information, that was previously used by this Client. This can be useful if a Client uses different cards regularly. Authorize: This will generate an Authorization Number for the Amount of the Receipt when Approved. This is a “captured” transaction. Note: If the transaction is Declined, it will be noted in the Status column and a reason will be given in the Response column. Pre-Auth: The Pre-Auth button is used to Authorize, but not Capture, a credit card payment. This process in essence “reserves” the customer's credit until the transaction is later Captured. This is a good way to determine if a customer’s card will be accepted without actually processing the payment. Capture: The Capture button will process a previously Pre-Authorized transaction. Phone Auth: This option is used to enter an Authorization Number that was provided outside of the normal process. Typically, this would be done when the Authorization process returns a request for the merchant to call the authorization center to provide information regarding the sale. Void: Void is used to cancel a previously Authorized transaction. Once the transaction has been processed through the Gateway, the Receipt is processed just like any other. The exception is that Receipts with Credit Card transactions may not be deleted/voided. After the transaction is Approved, click Done to save the authorization. Then click OK to save the Receipt and don't forget to Post! Prev: Receive a Payment from a Customer. Receive a Payment from a Customer. What's the Latest Version of AcctVantage?